At Quality Propane, we guarantee worry-free propane service. We’ll monitor your home’s propane supply and make sure you always have enough in the tank to adequately heat your home. And if you run into an emergency, just give us a call anytime. And when we say “anytime,” we mean it! We offer TRUE 24-hour service. No matter when you call, you’ll either get to speak to a live person, or if you have to leave a message, we promise to call you back within the hour. 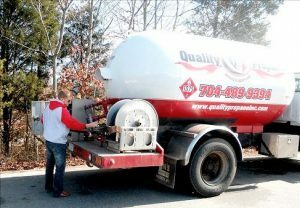 Quality Propane offers propane delivery services you can count on. After you place your order, it will arrive within 1 to 7 business days. We’ll even call ahead to confirm delivery of your order before it arrives. If you require after-hours delivery, it will be handled by a professional, uniformed service technician you can trust. We accept all major credit cards, including Visa, MasterCard, and Discover, and easy payment options are available. You don’t even have to be at home or work to handle the payments—we can take your credit card information beforehand, and then handle the delivery or service during the off-hours. And if you prefer, we’ll even set up a billing account for repeat service, so you’ll never have to worry about missing a payment. That’s the Quality Propane guarantee. Propane is propane . . . service is everything!